Some tracks in Re-Volt have fork paths which AI vary in taking left or right directions, as Museum 2. Does anyone know how to make them vary between the two sides instead of only going to the left every time? As far as I understand, the forks in the stock tracks still do have the AI preferring to take one path over the other. However, the preferred path may or may not be easy for AI to get to (eg the inner escalator on muse2 rather than the outer one), so a number of them end up close to the other route instead, which they do just fine with because it's set as a longcut. I'd guess the rule of thumb for getting a more even split would be to have one path be slightly more difficult to get to, and have the less difficult one be a longcut. Because the level geometry itself doesn't push the AI towards one side or another, all of the burden is on the nodes instead. Maybe have one side of the fork be the one the AI prefers to use (with its first node closer to the split), but have the node's width narrow down so there's more of a chance of the AI exiting the node? 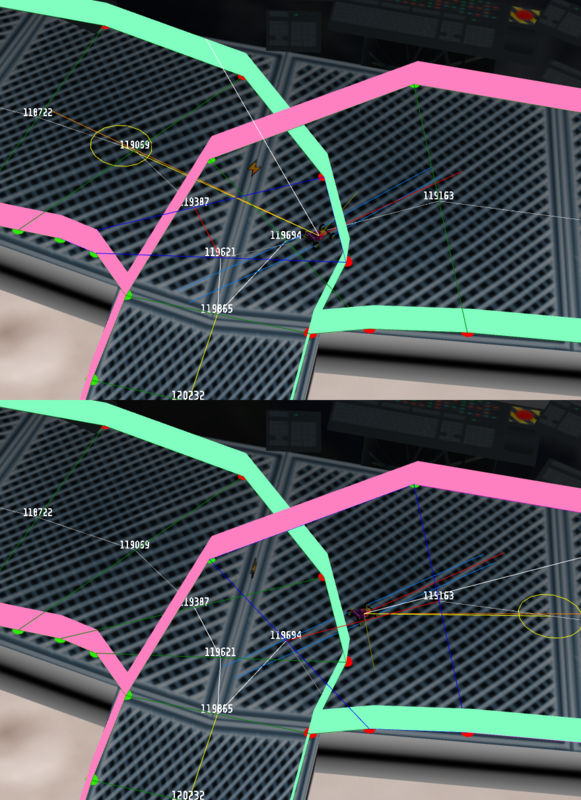 Also possibly worth noting is the structure of the nodes around the split in muse2. The optimal path has four or five normal nodes, while the alternate path is one long longcut node that covers a wide area (including the normal nodes). The AI seems to switch between the two, even when still within the normal nodes. Not sure if that's because of node types, proximity to racing lines, or a combination of the two, but something along those lines seems to play into it as well. Thx for this very useful hints, Gotolei. I can remember someone said, that the gazzasaicar-AI reacts different, than the "normal" AI? Is this correct? While playing around with Spa-Volt AI-nodes I recognised, that the gazzasaicar-AI never raced a left path of a fork, but the "normal" AI while a normal singleplayer-race did, with a chance of about 25%. There is defenitely some difference in AI choices between modes, although I'm not sure what it is exactly, and what modes trigger it. For instance, try letting an AI drive time trail laps with gazzasaicar: it'll always pick shortcuts and ignore longcuts / pickup routes, which is different from the AI in regular races where you drive yourself. Thank you for the tips Gotolei. Gonna try something later. And yes, that's the section I'm trying to tweak.